The Tea Party at K-Days Festival. In 2002 I attended my first “proper” concert: The Tea Party performed at the Shaw Conference Centre on New Year’s Eve. I was already a fan, and that show cemented them as one of my favourite bands. The show also awoke in me a passion for live music and I've been going to see concerts big and small ever since. A live show is always better than an album, but the memory of the live show later gives me a greater appreciation for the recorded music. I was excited to hear the band had reunited in 2011 and were touring around Australia, and when I heard they were coming back to Edmonton I was ecstatic. It was only a gig at the K-Days festival, but it was something. When I got a media pass to shoot the band, I was driven by excitement to focus that much harder in the pit. I scoped out the outdoor stage the day before, while I was at the festival—Platinum Blonde were playing. I was able to see what the light would be like at that time of day, as well as how much room there was in the pit. It wasn't very much, especially once you add a few security people and a couple other shooters. I packed light—just a single body, with a 24–70 and a 70–200—although the stage was fairly high and even in the pit I wasn't right next to the stage, which meant I had the 70–200 on for the majority. I also packed a little too light in terms of outdoor clothing—while waiting for the show there was a sprinkle of rain, and the sky threatened more. The weather held, although I actually wouldn't have minded either way. With a camera in my hand and a great band in front of me, nobody can rain on my parade. The Tea Party put on a great show; they were just as tight as ever, and you could tell they were enjoying themselves. 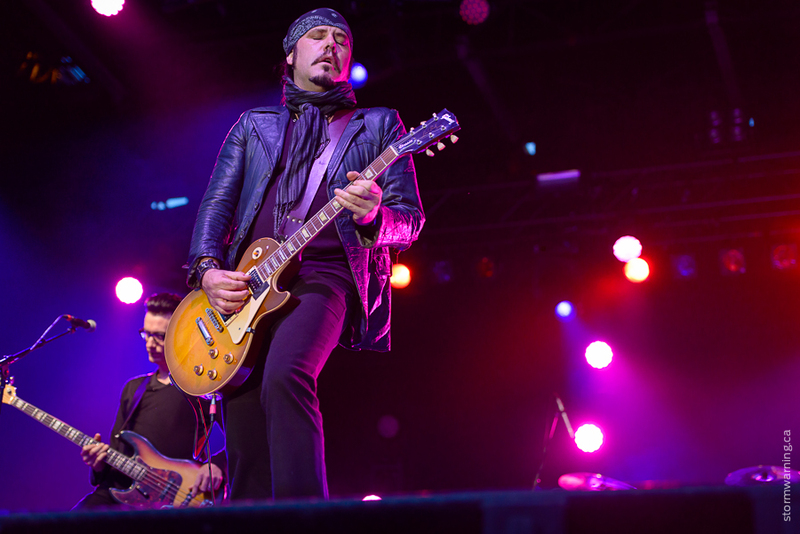 They took their time during the first three songs, with Jeff Martin starting things off with a bit of guitar-noodling. It was still pretty active in front of the stage, jockeying for position with the other shooters, trying to get a clean shot of Stuart Chatwood playing the bass or Jeff Burrows drumming. My fiancée surprised me at the end of the first three numbers and grabbed a picture of me shooting. We watched the rest of the show from farther back as the sunlight faded completely and the stage lights became more prominent. I can't wait to see them back this way, touring under their new album!